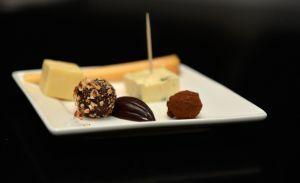 Cognac paired with Cheese and Chocolate? A good idea? In my book a great idea. I’ve written about it before (Food Pairings: Why they do work) but the more popular these pairing match up’s become, the more I seem to enjoy them. It’s always an interesting experience, as taste buds differ so much from person to person that everyone seems to get different things out of them.The first match up saw Bisquit VS paired with mature Dutch Edam cheese. Most of the Eaux de Vie for the VS grade Bisquit Cognac originates from the Bon Bois and Fin Bois appellations of the Cognac region, known for their more fruity flavours. It shines through in the Cognac itself with lovely fruit and citrus tones, and of course the ever present spices of vanilla, cinnamon,nutmeg, and subtle walnuts on the palate. The cheese pairing did wonders to subtly lift the fruit notes in the Cognac, and interestingly subdue the nutty notes, leaving a very fruity mouth feel. The chocolate of choice for the VS was a chocolate hazelnut truffle, which did a fine job of enhancing the walnuts in the Cognac.Next we moved on the the VSOP grade Cognac. In addition to the fruit-laden cru from Fin Bois, the VSOP also contains crus from Petit and Grand champagne, adding a strong mineral element to the Cognac from the relatively young and hard limestone soils in those regions. Il est magnifique , oui? The VSOP was matched with a 6-month mature cheddar cheese, which was quite fantastic. Apart from enhancing the softer mouth feel of the VSOP, the cheese unlocked previously hidden flavours of red berry and nuts. A Coffee-chocoalte pairing was just as good, the effect of the Cognac on the chocolate was to soften the strong coffee notes and leave a smooth Tiramisu flavour in the mouth with just a kiss of Coffee! The final pairing of the day was the simply delicious XO Cognac, with ripe Camambert cheese. The XO Cognac, certainly still stand out in the range for me, its 10-30 year old Eaux de Vie giving rise to lovely crystalised fruits, chocolate, spice, pepper, ginger bread cedar wood.With the soft cheese, the chocolate notes of the Cognac are enhanced, and a lovely nutty aftertaste added to the luxurious, dry and full bodied finish. The chocolate match up was a caramel truffle, and also worked beautifully, enhancing the sweeter flavours derived from longer barrel maturation. After the pairings were done, the real spectacle was rolled out for us to enjoy. 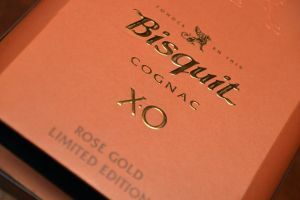 Two limited release and extremely rare Cognacs from the house of Bisquit. First up, the Rose Gold, a limited edition release of 1819 hand made 1 litre decanters. Only 6 barrels in total were produced of this Cognac, with roughly 90% of the blend coming from extra-old Grand and Petit Champagne stocks. The remaining 10% was from the Fruity Fin Bois, the overall effect of the Rose Gold being a Classic French Cognac XO style, loads of minerals and spice, with an ever present Fruit backbone. Lovely to try this unique blend, which is not even available in South Africa to purchase – currently you’ll find it in Airport Duty Free’s only. And as if it couldn’t get any better, the evening was capped off in pure Bisquit-style splendor, with the first tasting on African soil of Bisquit Interlude. 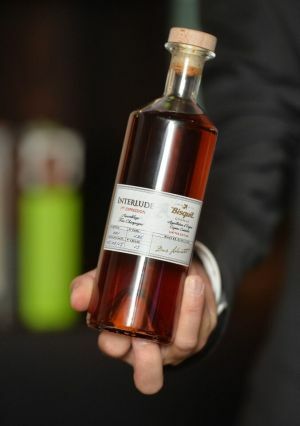 Not yet bottled or released, there will only ever be 20 Barrels of Interlude made available in the next 10 years (2 per year), and for only the most exclusive of Cognac connoisseurs. Interlude is selected from 15 different Eaux de Vies, from the vintage years of 1947, 1969, 1973, 1975 and 1988, making the oldest Cognac in the blend 68 years old! And doesn’t it show? Cedar wood, ginger, pepper, nutmeg, cinnamon all make fireworks in the glass, and culminate in the longest finish ever. Quite simply indulgence at its finest, and one feels as honoured to have tasted this marvelous creation, as you are certain that it is certain it is unlikely to happen again in your lifetime! 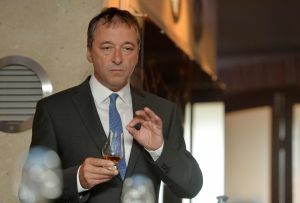 But for those who can afford ultra premium Cognacs, watch out for it in Duty-Free lounges from next year. It is spectacular.